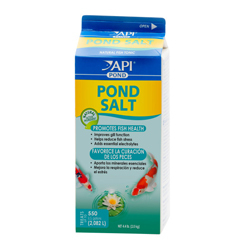 Provide essential electrolytes fish need to survive with an all-natural salt, made from evaporated sea water. Improves gill function, protects against nitrite toxicity & reduces stress by helping to maintain a natural balance of electrolytes in the body fluids of pond fish. Can safely be used with all PondCare® water conditioners, filtration materials, medications & fish foods. For Disease Treatment: Short-term salt baths are beneficial to eradicate many external parasite and fungal infections. In a plastic container, dissolve 2 1/2 cups of Pond Salt in 10 gallons of pond water. DO NOT USE TAP WATER. Carefully place the infected fish in the salt bath for 5-10 minutes. Do not leave the fish in the salt bath for more than 10 minutes. Return the fish to the pond. Treatment may be repeated after 24 hours. Important Note: Once added to the pond, Pond Salt does not evaporate and is not filtered out. Pond Salt should only be added, as directed, with each water change. Salt levels higher than 0.1% may cause plant damage.